The Church of St. Mary the Virgin, Aldermanbury, is a seventeenth-century English church located within the heart of mid-Missouri. This church once stood in the center of London, England, where Nazi bombs gutted it during the Blitz of World War II. It is the only building in the United States designed by renowned English architect Sir Christopher Wren, who designed and built St. Paul's Cathedral and many other London churches after the Great Fire of 1666. 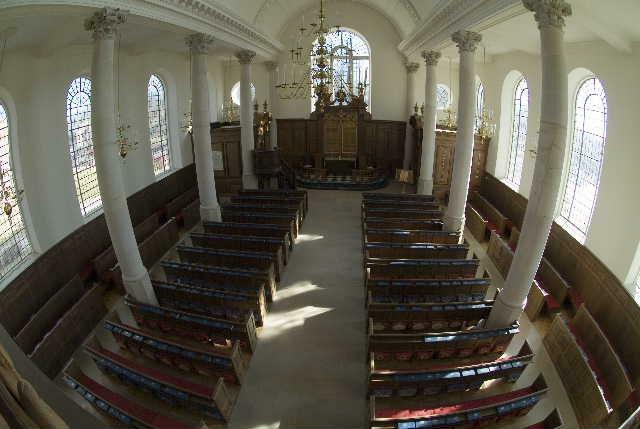 Westminster College brought this majestic church back to life for a new era to remember times gone by and as a memorial to Sir Winston Churchill's visit to Westminster College in 1946. Below the church is the National Churchill Museum, a world-class museum that guests to your wedding may also enjoy visiting. Historic church weddings offer a rich memorable experience to the wedding ceremony. With simple but elegant design, St. Mary's can accommodate many guests in a regal but beautiful atmosphere. Not only can we provide you with an elegant church wedding, we can also provide you with a stylish, sophisticated reception venue. At the Church of St. Mary, you will have the space to be creative in a historically rich setting found nowhere else. With the Church of St. Mary, you are not only getting a one-of-a-kind wedding venue, you also get friendly, professional staff that will work with you to ensure your special day is like no one else's. Experience small town hospitality that comes from the heart. It is your day. We want to make sure it is all about you!